I get to Aubrac in torrential rain, dense cloud and wind. Very glad to be out of it, it has been a hard horrible cold day. My bed for the night could not be better to wait out the weather. 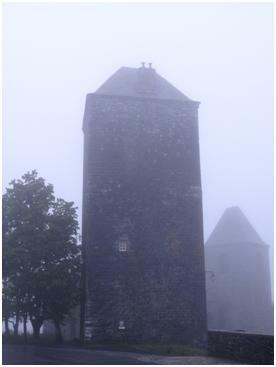 It is in a medieval tower, built by a Flemish knight in 1120 who almost died in a storm and in thanks for surviving the storm and attack by bandits, built a refuge for pilgrims. My room is up a steep winding stone spiral staircase which goes up about 5 levels with a single large stone room on each filled with bunk beds. The cost is 8 euros for the night. Very nice, warm and dry. My fellow bunkmates are one Swiss schoolteacher, Jurt; Clementine, French, 20 years old and studying medicine, who I walked with for part of the day and a refined elderly white haired lady called Jan who looks about 65. 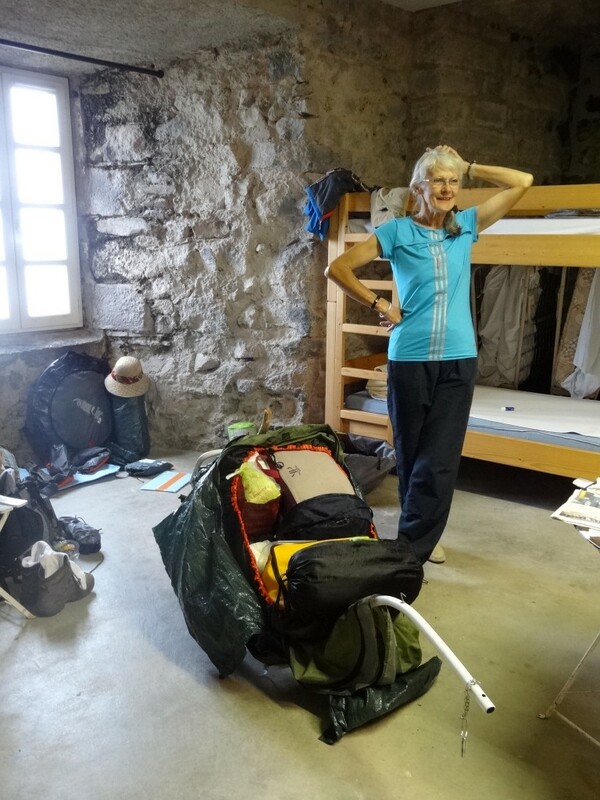 Jan amazes me with the amount of stuff she is carrying or rather pulling. She has a 2-wheeled cart, which she has a harness to her hips and straps to her shoulders for. The cart contains the contents of what looks like a small house. Included in all her baggage is a dog called Szighi. She has been walking since March (we are now in June) and she covers about 8 – 12km a day. The next day is a walk to Saint-Come d’Olt. The wind and a drizzle mist have not cleared up. I pack and repack my backpack, delaying the inevitable. Climbing into my rain gear is a bit of a pallava. It has zips down the side and a built in hump for my pack, so I am totally enclosed. Setting off the path soon leaves the road and starts a long steep wind down for the next 8km. The priority today is to keep my feet dry, I have seen the results of a few other people (all wearing trainer type walking gear, rather than hiking boots and the sight is not pretty). Keep feet dry is easier said than done. The footpath turns perfectly channels the water down hill and I am walking more in a stream than a path most of the time. three men who are perfectly synchronised, so closely together they almost look like one, trot fast by. They are all dressed exactly the same black lycra shorts, red tops, white peak hats plus camel packs. They are all small and look like a cross between Super Mario’s and hobbits. They shout a staccato ‘bon jour! bon jour! bon jour!’ and are gone, so fast I am not quite sure they were there, a bizarre hallucinaton… plus they make me feel very slow and lumbering with my pack. The next people I encounter on the path are a caped man and woman appearing through the mist, leading a heavily laden donkey in the opposite direction. We exchange a mix of Franglish, “how far to…?” and they too are gone.